In the world of comic books, even the unsure readers will understand the concepts of alternate timelines and universes. When a storyline gets looked at from a different angle or a character has a change of morals, these deviations can take a classic story down a completely different route. During a 5 week event, the creative minds at IDW Publishing have picked 5 chart topping comic book franchises and they are looking at one of their key elements from a skewed view. One of the comics to get this one-shot treatment is the “Ghostbusters” and in this world the Ghostbusters NEVER CROSSED THE STREAMS! 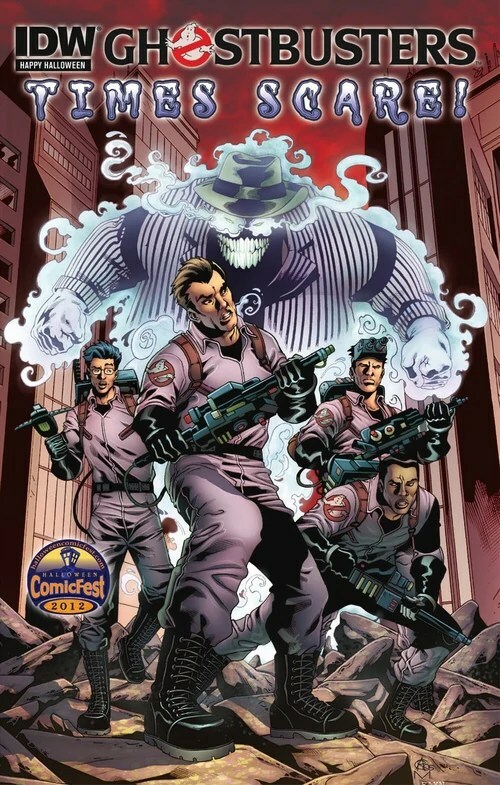 As much as this is a monumental moment is the Ghostbuster’s history, this is a monumental road to take for this one-shot issue and the story is built in the classic Ghostbuster’s form. The chemistry of the characters are intact, but without their victorious moment, the guys are trapped in an unknown limbo. The New York, they know and love is replaced by mass hysteria. The hysteria is in the form of an unwanted guest that has stayed far past its welcome. 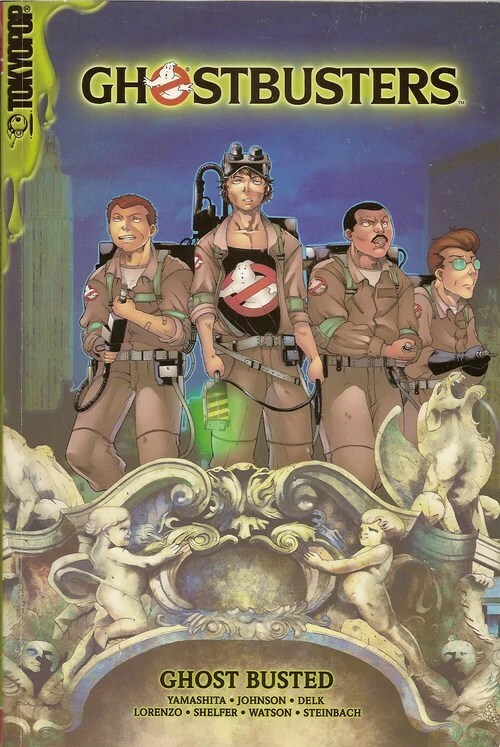 The story, that was written by Kelly Thompson (better known for her work on Jem and the Holograms), is constructed in a great way that will allow the newest Ghostbusters reader to jump right into the stream and the veteran fans will enjoy the alternate view of one the franchises most iconic moment. 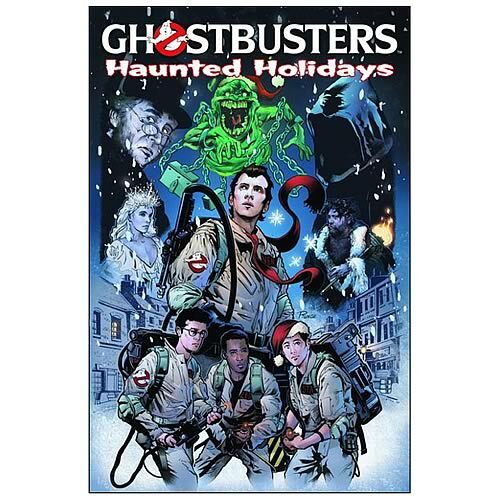 The art for this issues was created by Nelson Daniel (known for his work in the Judge Dredd series) and Daniel’s excellent work continues the visual standard set by the Ghostbusters comic book series. I would definitely recommend this alternate view at this Ghostbuster’s moment, as it transcends the pages and asks the fan to take a different look at this iconic moment in pop culture history. In the end, I will give “Ghostbusters:Deviations” a 8 out of 10. This Summer…Who you Gonna call? Hello Everyone My name is Philip Morgan and my friend Josh told me to right a blog for our page. For those that don’t know, I am a diehard Ghostbusters fan. Josh and I had talked on and off about the franchise for as long as he’s known me and he wanted me to share with all of you how I enjoy what I like to call The Ideal Ghostbusters marathon. With the Ghostbusters reboot around the corner now sounds like just a good a time as any to tell you guys how I like to enjoy everything the Ghostbusters Franchise has offered so far that I could manage to get a hold of. I shared this info with Josh and he said, “Dude you so totally need to write that down and share it, because that is not a marathon, it’s a Gauntlet 🙂 Now were not just talking watching the 2 movies and boom you’re done. Don’t get me wrong I can do that anytime, because those movies are so much fun. I can watch those anytime any day. If either one happens to be on TV, I will stop what I am doing and just watch it. Now for The Ideal Ghostbusters Marathon I do this once a year. This is a good way to do it because you don’t want to get burned out or bored with a franchise and you don’t want to drive your loved ones crazy with over saturation so you can just ease your way into this marathon and take your time. It gives me something to enjoy all year round because it takes some time to do. Could take a whole year depending how much time one has on their hands. 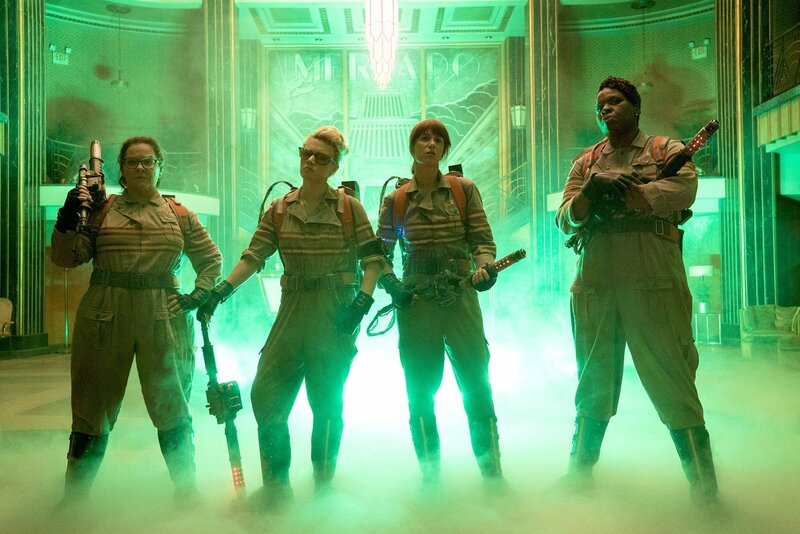 The Ideal Ghostbusters movie starts simple enough with the first Ghostbusters film. This includes watching the film in all its glory, plus watching the Deleted Scenes. If you know the movie as well as I do it is not hard to know where to insert the Deleted Scenes while you are breezing through the film. Now I start watching the film all the way to the point where the Ghostbusters capture Slimer. 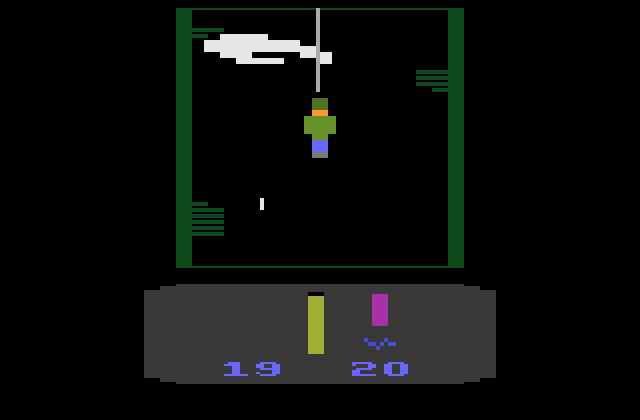 Then I will stop the movie and play The Ghostbusters video games for the Atari 2600, NES, and The Sega Master System. Then I will resume the film and watch the montage scene up to the point where Winston Zeddemore gets hired. I stop the film again and watch The Real Ghostbusters Promo pilot for the cartoon because the Ghostbusters are depicted in there Tan uniforms and Winston is present leading my head cannon mind to the conclusion that this scene takes place soon after he was hired. After that I watch the Ghostbusters music video. I resume the film up to where Peter and Dana talk about her case and just before the scene changes I stop the film again. Are we having fun yet? 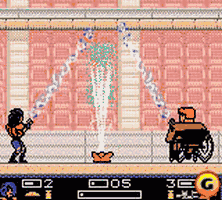 At this point I play The Ghostbusters video game for the Sega Genesis. After that I finally finish watching the first movie. Then I start watching The Real Ghostbusters cartoon starting with the episode Citizen Ghost this episode tells the story of what happened after the first film and how the Ghostbusters wind up with new uniforms. After that I enjoy watching season 1 of The Real Ghostbusters which is 13 episodes. 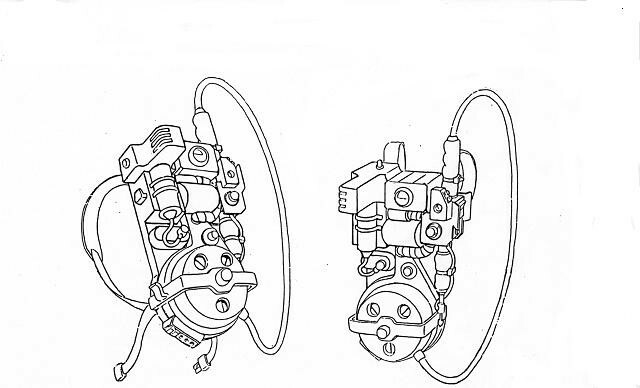 After that I read all The Real Ghostbusters comic books and Coloring Books and other related activity books. Even if some of the activity books don’t have story and dialogue the art work is really fun to look at. 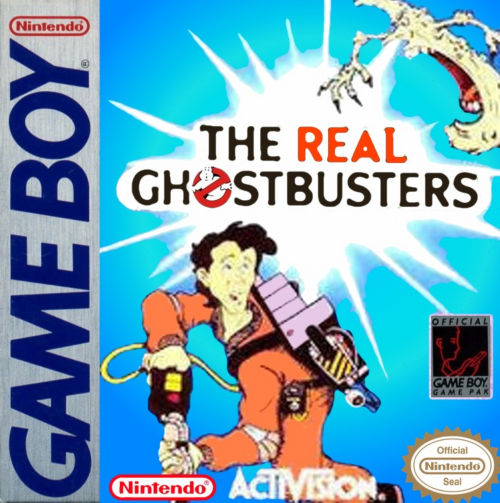 I will also watch The Real Ghostbusters Arcade Gameplay and Play The Real Ghostbusters for The Game boy. After that I continue watching season 2 of The Real Ghostbusters which is 65 episodes. I like to watch the episode Ragnarok and Roll last because I feel that episode is a great way to end the Season. Then I watch Season 3 of The Real Ghostbusters 13 episodes. I like to end this Season with The Boogieman is Back. It’s a strong end to this season. 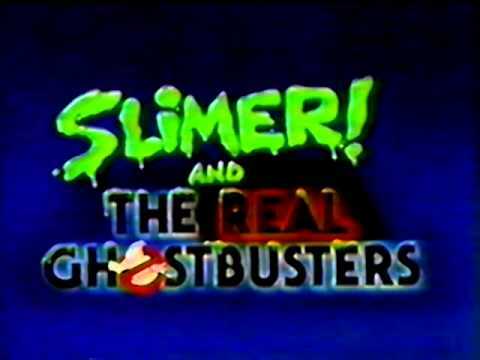 By Season 4 the show changed its title to Slimer and The Real Ghostbusters and it would be an hour show containing a Slimer episode a Real Ghostbusters episode and 2 more Slimer episodes. I watch the Slimer cartoons first then watch The Real Ghostbusters Segments. Out of the 33 Slimer episodes the one I can’t miss is Don’t Tease the Sleaze because the Ghostbusters actually bust a ghost called the Sleaze in that episode and he makes a later appearance in The Real Ghostbusters. Then it is time for Season 5 of The Real Ghostbusters 21 episodes. I like to end this season with The Halloween Door. 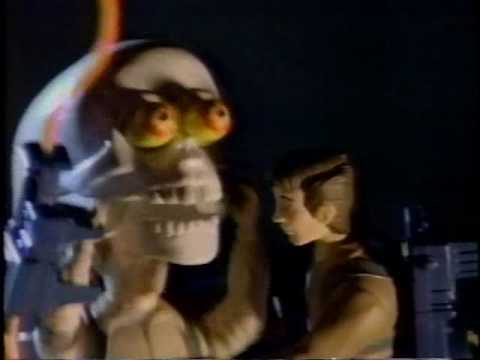 This is the shows third Halloween themed episode and this episode originally aired in prime time and is an awesome episode to end the season. Mostly because it feels like the original film. With ghosts taking over all of New York and the Containment Unit Blows up it’s just epic. It would have been perfect if this was the last episode in the series. Now we watch Season 6 of The Real Ghostbusters which has been reworked a bit with new Theme Song and Score. This Season has 16 episodes and even though this season contains more toned down episodes than the previous seasons, this season has one of the best episodes in the series. The Episode is called Janine You’ve Changed which addresses all the changes that Janine went through as the series went on and gave a reason she was changing. A Creature that pretends to be her Fairy God Mother. Now we bring The Real Ghostbusters to an end with Season 7 only 4 episodes long. 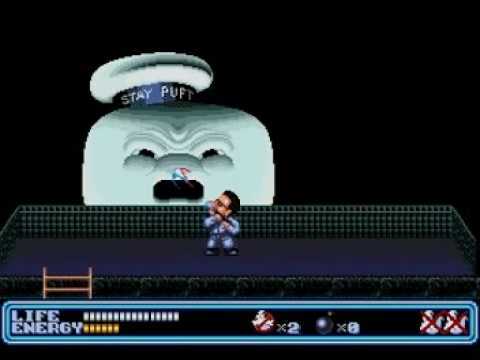 My Favorite is Not Now Slimer where the Ghostbusters face an entity that is made up of all the anger and hate of every ghost they have ever captured. After 140 Episodes of The Real Ghostbusters and 33 episodes of Slimer it is finally time for Ghostbusters 2. This includes watching the deleted scenes that are now available on the Blue Ray. Same method as with the First Ghostbusters movie. 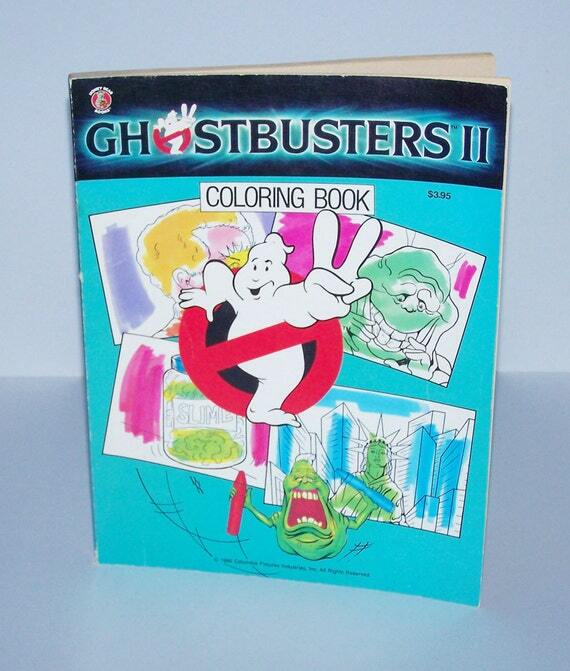 Then it is reading every coloring and activity book based on Ghostbusters 2. Which there are quite a few. Then it’s back to watching the rest of Ghostbusters 2. 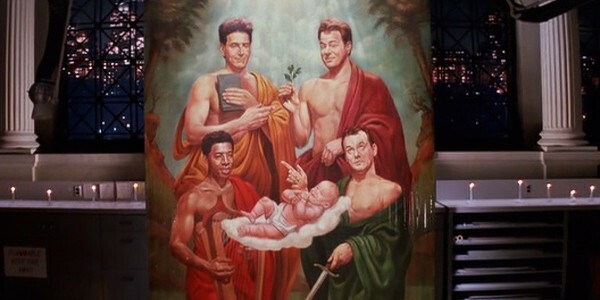 Ghostbusters 2 marks the end of an era. 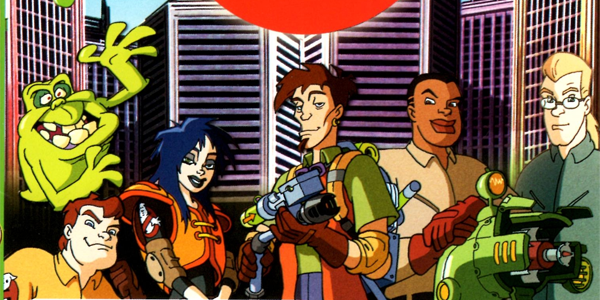 Then a new era begins with the animated series Extreme Ghostbusters. This Show lasted 40 episodes and introduces a team of younger Ghostbusters Mentored by Egon Spengler and Janine Melnitz. The way I tackle this series is not very difficult. This series didn’t last long enough to have a whole lot of merchandise around it. This show sadly fell a bit under the radar due to its time slot. I start by watching the first 2 episodes Darkness at Noon Parts 1 and 2. These two episodes do a pretty great job reintroducing us to the world of the Ghostbusters and introducing us to the new team that we will be following through the rest of the series. Also we get to see this new crop use the original equipment only to find it has little effect on the powerful entity they are fighting. 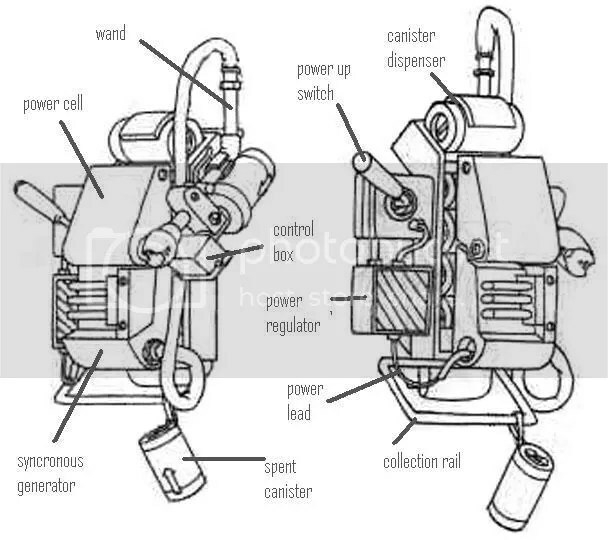 So Egon has to upgrade the equipment and give us this new equipment that doesn’t look nearly as cool as the original stuff, but the last time we saw the Ghostbusters it was 1989, this show takes place in 1997 so changes needed to be made. After watching the first 2 episodes I watch the Extreme Ghostbusters Toy Commercials and TV spots to get myself pumped for the new series. 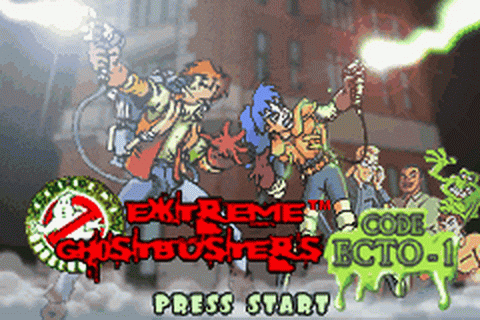 After That I play The Extreme Ghostbusters Video Game on the Gameboy Color and Gameboy Advance. For the longest time this is where the marathon ended, but in 2004 there was something new that came to the Ghostbusters Franchise. That would be the 4 issue Ghostbusters Legion Comic Book and a SDCC comic short entitled the Zeddemore Factor from 88 MPH Comics. Just in time for its 20th anniversary. So I read the Zeddemore Factor and The Ghostbusters Legion Comic Books. Then I read the Ghostbusters The Return Novel by Sholly Fisch. To most fans this story is not cannon, but it is a fun read. After That I read the Ghostbusters Manga entitled Ghost Busted. 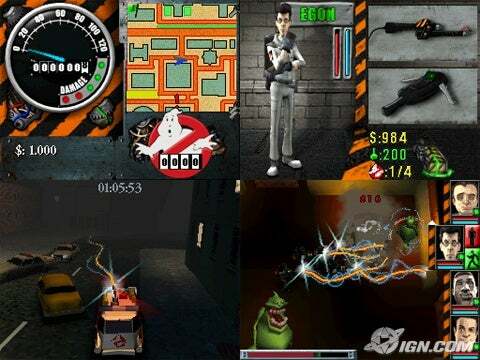 Then I read all the Articles and video game guide about The Ghostbusters Video Game for the 360, PS3,Wii and DS. Just in time for the 25th anniversary. 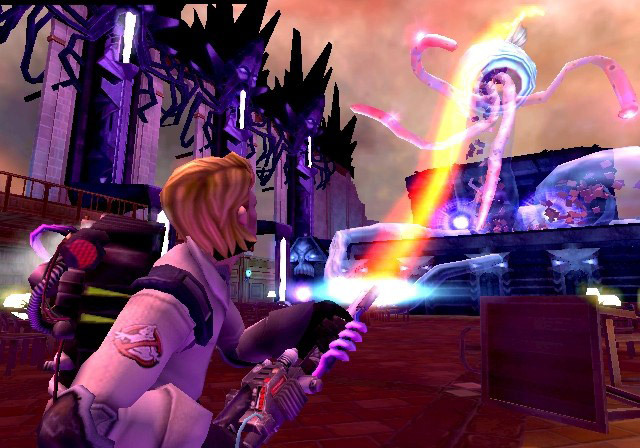 Then I will Play Ghostbusters The Video Game for the Wii. 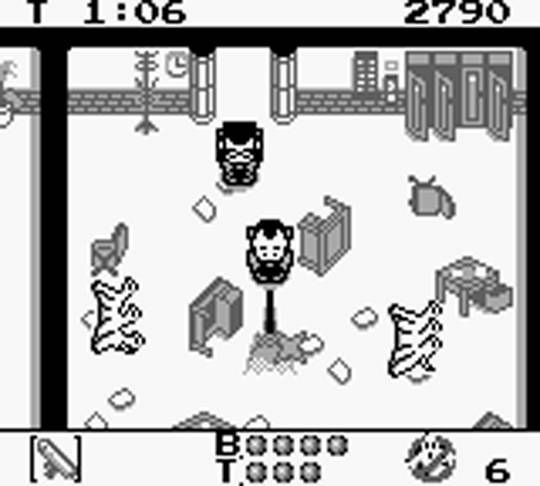 These Games do a wonderful job for getting me pumped for the next stage on the marathon. 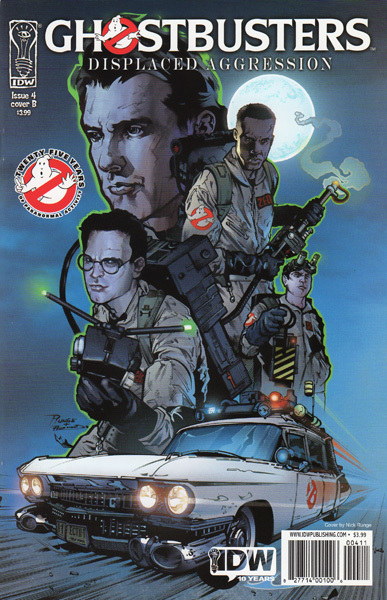 Now I read the Ghostbusters Comics from IDW. Starting with Ghostbusters The Other Side which is 4 issues long. Then I read Ghostbusters Displaced Aggression. Once again 4 issues long. There are 4 one shot issues that follow a holiday theme titled Haunted Holidays. Then I read a short paperback story titled Ghostbusters Time Scare. Then I Read the Comic Book event Titled Infestation. 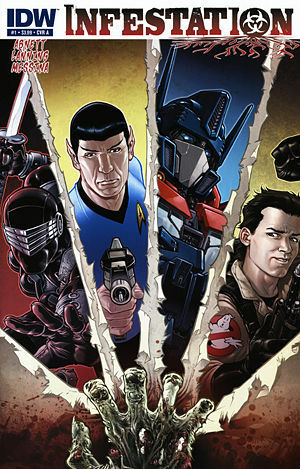 It is a huge IDW Crossover event that ties other properties together including Ghostbusters. Then I read all the Ghostbusters Ongoing from IDW 36 wonderful issues. That ran from September 2011 all the way up to the 30th anniversary of the franchise. Now more can be added to this list because I am happy to say that Ghostbusters is still a living breathing entity. Especially with the New Remake on the Horizon. This is how I enjoy everything that is involved with the original Ghostbusters universe. I doubt the Remake will have a place in this marathon, but as of right now we will have to wait and see. Now I will share with you how I end the Ideal Ghostbusters Marathon with a bang. 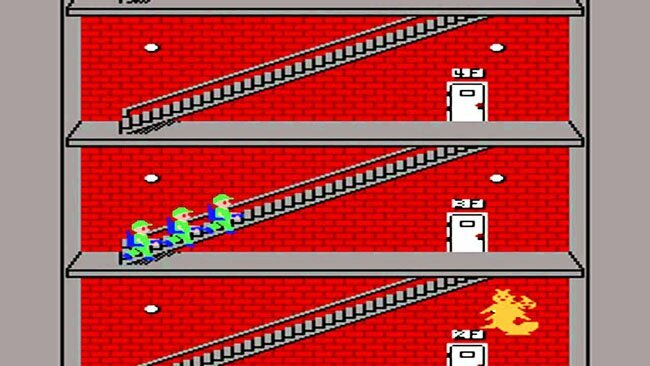 After I go through all the actions above I end the marathon by playing Ghostbusters The Video Game for the XBOX 360. 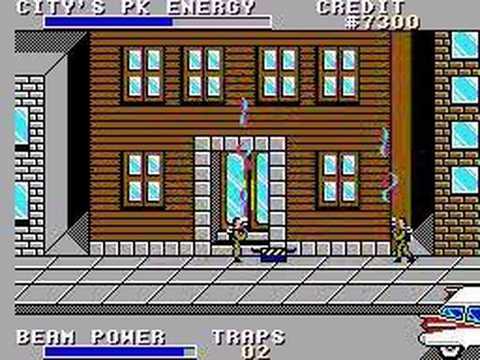 This is the Realistic Looking version to the Ghostbusters games that were played earlier, but to me this game is an incredible high note to end the marathon on and to me is the official Ghostbusters 3. Well that’s it for what I feel is the Ideal Ghostbusters Marathon. As my Ghostbusters Collection Grows this marathon could very well change, but as of the time I am writing this article this is how I do it. I Hope you enjoyed this long winded blog. If you did thank you very much for reading it, and if you hated this, please blame Josh. It was his idea.